Criminals use many online venues to sell stolen merchandise. eBay strives to be the Internet industry leader in online fraud investigations in the effort to combat occurrences through our Global Asset Protection team that effectively partners with over 300 retailers to proactively identify and remove stolen property listed on our site. Our collaboration with retailers and law enforcement is committed to flushing out online criminal activities, whether it is on Amazon, Craigslist, or eBay. Our experience through our online fraud investigations has shown that many criminal sellers are not site loyal and will sell across many sites. To achieve our commitment, we work to educate our retail partners from an insider’s perspective on the effective methods to search for stolen product online. By sharing effective methods to investigate online crime, it helps eBay maintain a safe and secure shopping experience. 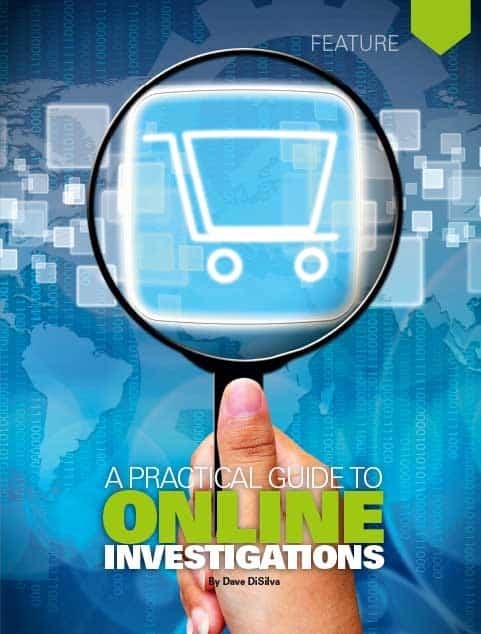 Continuing with our partnership principals, we developed this instructional guide to demonstrate best practices when conducting online fraud investigations. The experience acquired during my retail career, coupled with my eBay experience, has provided me with a unique perspective on addressing the issue. Many of the things retailers do to develop effective asset protection programs are the same things that can be done to create an effective online fraud investigations program. While not 100 percent inclusive, this article outlines many of the items necessary to develop an effective online fraud investigations program. Combating stolen property online starts with your company’s information. Partner with the appropriate departments within your company to develop an understanding of the factors that affect pricing and inventory cycles to help build your online fraud investigations. This preparation will help determine the lowest acquisition price and reasonable quantities available. An investigator armed with this knowledge may calculate accurate thresholds to highlight outliers in price, volume, and the many ways your product is obtained for resale. Shortage and Inventory Control. Most retail loss prevention professionals understand that the shortage and inventory control departments are the primary source of your historical shrink losses and cost information. The information housed here may be harnessed to provide meaningful reporting to help your searches. • Identify your historical high-shrink items at a description and SKU level. • Work with your shortage-control team to focus on merchandise loss minus paper-shrink issues. • Know where your high-loss stores are located and what merchandise contributes the most to overall loss in those locations. • Partner with your inventory- and shortage-control teams to understand the product life cycle from purchase order through the clearance process to jobbers. • Review cycle-count results and known-theft losses for trends in product type and location. This info can be used to focus searches on trouble areas. Merchants, Planners, and Buyers. The activities of this department directly impact acquisition pricing and landed cost. This product knowledge helps an investigator focus on implausible listings and sellers. • Know your clearance, BOGO (buy-one, get-one free), and loss-leader items to develop an understanding of the pricing and life cycle of your merchandise. • Identify private-label merchandise. This merchandise is ideal to review as the product is only sold by your company, which limits the acquisition methods and pricing. • Partner with merchandise buyers and planners to get early notification of new hot products and their launch dates. • Check to see if your company is an Amazon or eBay seller, as many retailers use online as another channel to reach their customers to sell clearance product. However, retailers often use seller names other than the company name when selling online. In some instances, retailers hire a dedicated third-party seller. Therefore, find out what names are legitimate sellers of your merchandise. • Review your policy on how samples, displays, and vendor SWAG (stuff we all get) are expected to be handled and documented. • Review how your company monitors manufacturers and suppliers focusing on product overruns and cancelled orders. Marketing. The marketing team can provide details on all of the past and planned promotions. • Be aware of new and grand reopening stores’ product giveaways and door-buster items. • Your marketing department can also help you understand your loyalty and award programs and the implications of the benefits on product pricing for members. • Obtain the launch dates of upcoming coupons and BOGOs. Accounting and Sales Audit. Information regarding credit card chargebacks is directed to this department for research. The reports received from credit-card-issuing banks and consumers may contain useful information to help identify credit-fraud rings. These rings may use many stolen credit cards to purchase your merchandise and list it for sale through online sites. • Review chargebacks because they are the perfect exception report. Each reported chargeback is nothing more than a report that a crime and a financial loss has occurred. • Chargeback merchandise does not add to your shrink loss on a balance sheet, but could be the suspicious product you see listed on Amazon, eBay, and Craigslist. • Chargebacks that occur on your e-commerce site, from catalog sells, or sent from a store may be able to provide a ship-to address, tracking information, an IP address, mac ID, or email address. Check with your IT group to see what information is captured and how long it is maintained. • Develop a process to track and research chargebacks in order to identify the product purchased, where it was sent, and if there is a pattern to the loss. Supply Chain, Distribution Centers, and Logistics. Perhaps the most productive area to understand is logistics and supply chain. This area is responsible for moving your merchandise through its entire lifecycle. While moving the product, exceptions occur on a daily basis. Creating actionable reporting for these exceptions will provide a better understanding of the avenues of loss and a potential source of the product you see online. • Shipments or cartons reported lost in transit to your stores may provide a creative seller a legal opportunity to obtain your product cheaply and in bulk. Some carriers are permitted to sell your product that was part of shipment claim. For example, carrier XYZ loses a pallet of 200 cartons, and they reimburse your company through a claim. Later they locate the pallet, which they have now purchased from your company. What do they do with the product? Many carriers have private auctions where a savvy buyer can purchase your missing product for pennies on the dollar and resell it on online sites. Check your carrier agreement to learn how they are expected to dispose of lost and then found product. The U.S. Postal Service holds auctions for packages when they cannot determine who the owner is. At these auctions pallets of mixed product are sold cheaply to the highest bidder. • Identify your jobbers, the products they handle, and the requirements of how and where they are permitted to dispose of damaged or clearance product. • Review your records of the merchandise sent to jobbers and compare it against the product you see online. • Determine if your return-to-vendor (RTV) products are resold online. RTV products that are sent back to the supplying vendor in sellable condition may be another source of bulk product you see online. E-commerce. Evaluate your ecommerce site, determine what buyer information is captured during a transaction, and evaluate the ability to detect and respond to criminal activity. Some of the attributes to capture include IP address, machine ID, shipment-tracking information (address fields 1 and 2), and the email address used to place the order in addition to the relevant credit-card account information. Work with your ecommerce team to develop a repository that you may access to research past transactions and chargebacks as this will help you identify and differentiate patterns of abuse from one-time issues. As a part of your online fraud investigations it is critical to be able to link the credit-card number to the ship-to address and the shipment tracking information, as criminals often change the ship-to address and divert merchandise once it is in transit. Now that you have developed a thorough understanding of the legal ways to acquire your merchandise, the pricing cycle of your merchandise, and true cost, you are ready to locate listing outliers. There are several tools that can help accomplish this. We don’t endorse these tools, but offer them as options to be considered as you conduct a search. The eBay Advance Search. Located on the eBay site, the advanced search (ebay.com/sch/ebayadvsearch/?rt=nc,) filters through current and recently completed listings by eBay user ID, merchandise description, category type, and zip code. You are able to limit your search by price range, so you can set the lowest acquisition price at the top price and pull back all results that are below it. You can review feedback history for items sold and the selling prices, which can help you understand the seller’s entire profile. The search feature provides the ability to conduct focused searches by state or city. Be sure to review a sellers ID history to determine what other IDs may have been used. 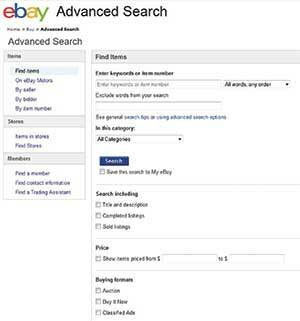 You may request instructions on how to use eBay’s advanced search module by emailing PROACT (at) ebay (dot) com. Amazon. Amazon.com provides a site for individuals to list new and used merchandise on its platform. Small individual sellers of used and new goods go to Amazon Marketplace to sell goods at a fixed price or Amazon Auctions to sell merchandise to the highest bidder. At this stage you will be provided with listings and price ranges for the search item. Now you can compare your actual cost information to the selling price to locate those listings that are significantly below your cost and promotions. • Select the seller and you are provided the reviews regarding the seller. • Select the “Detailed Seller Information” link and you are provided with information on the seller. From this page you may contact the seller using the contact page. Using the third-party tools described in Step 3, you may identify merchandise of concern and evaluate the business plan to determine if you have a potential issue. Craigslist. Craigslist is a classified-ad website divided into several sections. Sellers may list merchandise for sale as well as housing, items wanted, services, and discussion forums. • Select the region you wish to search. • Enter a product description into the search bar. • The current listings matching your search are returned. Many of the listings returned include a phone number to contact the seller. This information may be used to identify the seller. Third-Party Tools. There are a number of third-party applications that can aid your research. The Price Geek search results. • ThePriceGeek.com is a free site that provides searches by product for any currently and completed listed item that sells for over $75. It searches Amazon, Craigslist, and eBay in Australia, Canada, United Kingdom, and United States. The search returns the current average list pricing and recently ended auctions average of price and listing duration, which provides an effective online exception point. The outliers of current listings are plotted on a scatter graph. 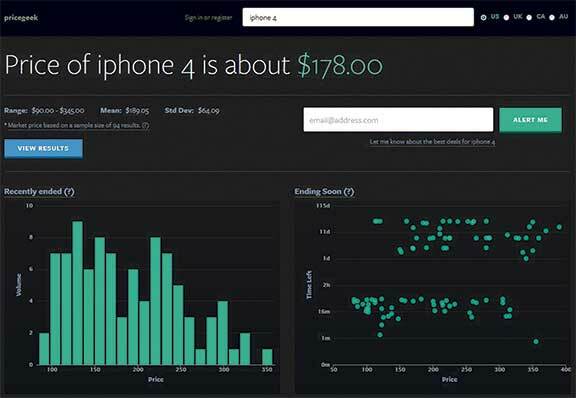 The graph is interactive and allows the user to click on the outlier, which directs you to the listing on Amazon, Craigslist, or eBay. The user may limit the results to top sellers and listing type. The site provides an email alert feature to notify the user of exceptions based on the criteria entered. • Terapeak.com is a subscription-based search tool that provides the investigator total sales volume dollars and units, and average pricing for programmable time ranges. The site searches Amazon and eBay in Canada, United Kingdom, and United States. Amazon historic reporting was added in June 2013. Completed listings may be searched by selling type, product, average price, seller ID, and category going back one year. It has a reporting feature that provides the top sellers of specific merchandise, and the ability to create basic exception reporting that is emailed to you on a daily, weekly, or monthly basis. Terapeak provides free training videos to walk the subscriber through each function of the tool. • adhuntr.com is a free search tool that provides the capability to search many different sites by selecting from a drop-down menu and entering the merchandise description. Sites available for search include Amazon, Craigslist, and eBay as well as classified sites, such as Kijiji Canada, Backpage, Oodle, and Gumtree. A helpful feature is the “All of Craigslist” search, which returns results from all Craigslist sites in one search. It returns current listings and completed listings going back 60 days. While there is no summary available, the listings often contain information on how to reach the seller. Now that you have identified a seller that is potentially involved in criminal activity, calculate the profitability of the seller. 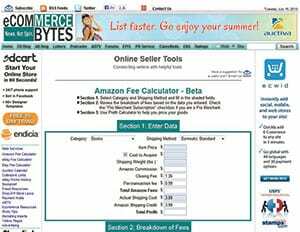 Try using one of the free pricing and profit calculators from ecommercebytes.com, such as the Amazon fee calculator shown. It will help you develop a better understanding of the selling price points that are necessary for the seller to achieve a profit. • Item Price, which would be the price listed. • Cost to Acquire. Using your cost of an item and knowledge of lowest markdown price, BOGO history, and coupons available, calculate the lowest price a seller could obtain the product. • Shipping Weight. Estimate the actual weight of the product plus shipping materials. • Cost to Ship. Determine the approximate shipping cost by carrier minus shipping charged by the seller. The calculator returns an amount of profit or loss based on your entries and includes the approximate fees charged by Amazon. Based on this calculation, you can determine if the volume and price of the merchandise is realistic and represents a sustainable plan. To notify Amazon of concerns regarding suspected stolen merchandise, use the following link: amazon.com/gp/help/reports. You are asked to provide your email, the name of the seller, the order number, and listing ID. There is also an area to provide your comments and concerns. To notify Craigslist of concerns use the link: craigslist.org/contact. Complete the form that will be forwarded to customer service. Be specific regarding your concerns. You may also email directly at abuse (at) craigslist (dot) org. Be specific about your concerns. To notify eBay’s PROACT team of suspected criminal activity, email PROACT (at) ebay (dot) com. Retail loss prevention departments in North America seeking assistance with online fraud investigations relating to eBay or PayPal may also use that same email address. For European issues, email PROACT-EU (at) ebay (dot) com. Other useful information is available in the Law Enforcement Center under the More Resources tab in eBay’s Security Center: ebay.com/securitycenter. Following are some additional helpful free or low-cost online search tools. • blackbookonline.info and virtualgumshoe.com–Both provide free public-record searches and directs you to free public-record sites based on your input. • pipl.com—Provides free public-record searches by name, email, user name, or phone. • spokeo.com—Searches on email, phone, username, and address. Requires an annual fee of about $50. This article was first published in 2013 and updated November 1, 2016.